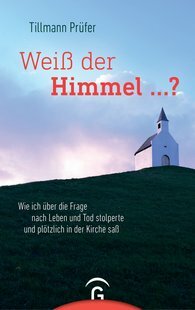 Original Title: Weiß der Himmel ...? Tillmann Prüfer is a noted Zeit journalist who in this book addresses the issues of life, dying, death and meaning. A difficult period in his best friend's life involving illness and death caused the convinced agnostic to confront the question of faith. Foundations of his previous life begin to totter, he begins to doubt, learns to pray, starts going to church regularly and finally reflects his thoughts in a monastery. This book describes the author's authentic search. "All of a sudden I was in a situation in which I was in urgent need of faith and optimism."